Shop the range of washable and disposable adult bibs depending on the needs of the user. For a cost effective way of protecting clothing the washable bibs would be a better option for you. 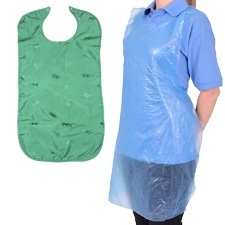 Disposable bibs are also available which can be easily changed for convenience. Stick on bibs are easy to apply and have a light weight feel. Tie on bibs can be secured in place for added protection.